YOGA with Cia! 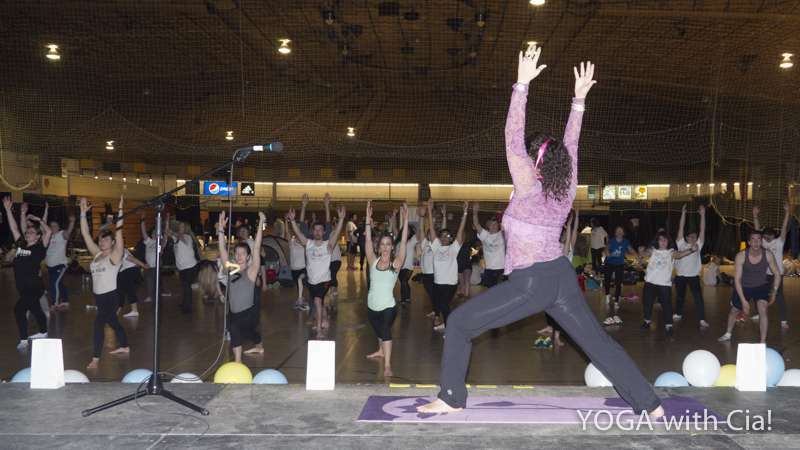 "making yoga fun"
YwC Spring Challenge is Here! Yoga can enhance your life, no matter what your age or fitness level! Many people are discovering the wonderful benefits of this ancient form of fitness. 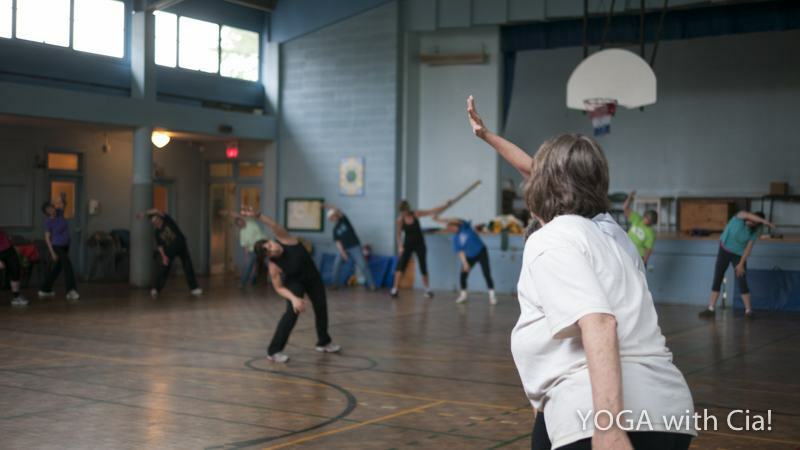 In Halifax, come and discover for yourself, how a more modern, YOGA with Cia! class may be just what you need! 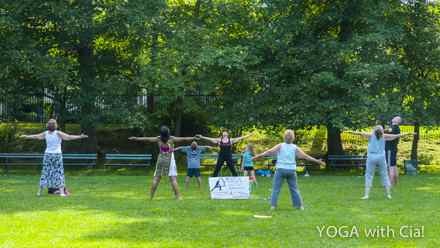 Reach and maintain your fitness goals with a yoga-based workout program developed specifically for you, or a special session for your small group! Our Internationally Certified, Halifax based Personal Trainer, Cia Tweel, can offer you the guidance, expertise and motivation needed to greatly improve your personal fitness... and have a little bit of fun. YOGA with Cia! 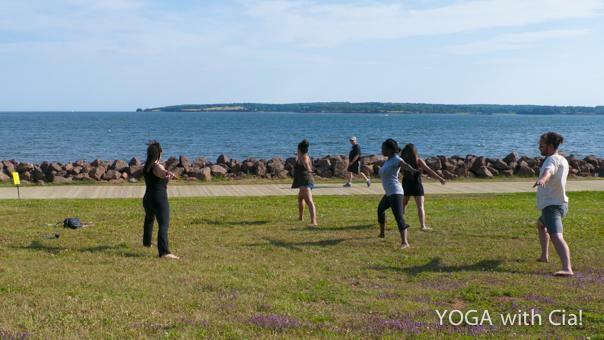 provides yoga services and yoga classes in Halifax, to adults with all levels of experience, always maintaining a focus on "making yoga fun." YOGA with Cia! is a division of Cia's Body Works. Cia's Body Works provides a wide range of Personal Training, Fitness, Dance and Yoga services, as well as Fitness Warm-ups, Presenting and Consulting, to individuals & organizations sharing our goal of "making fitness fun." Take a break from your busy day and find some balance! Feel stronger, more focused and centered, at the same time feeling relaxed and more limber! Yoga with Cia! is good for all ages and levels, from beginners to experienced Yogis! Come enjoy our non-competitive and non-judgemental environment. This practice, incorporating the best elements from Vinyasa, Flow and Hatha Yoga, can improve your strength, flexibility and balance, while helping to de-stress and energize you. We have four separate group class/times per week, Tuesday & Thursday afternoon and Monday & Thursday evening... and one private training option available to choose from this month. Happy Easter Monday, April 22nd., there will be NO class. Please come Tuesday or Thursday, as our regular yoga class schedule is currently in effect. Our 4th Annual YOGA with Cia! Spring Challenge is Here! More details down below. Pssssst! If you don't like challenges, no worries, just come take a 12 week evening term for only $79... or $59 for Skinny LunchTime-Tuesdays. You'll get a great rate on a term filled with themes, plus some goodies... and no stress! Also, Pass Card holders and Drop-ins are always welcome. BUNDLE UP! YOGA with Cia! Term, Plus Free Lolë Yoga Mat, for 1st Timers Bundle! See more details below. Thanks for coming out to our POP-UP YOGA with Cia! 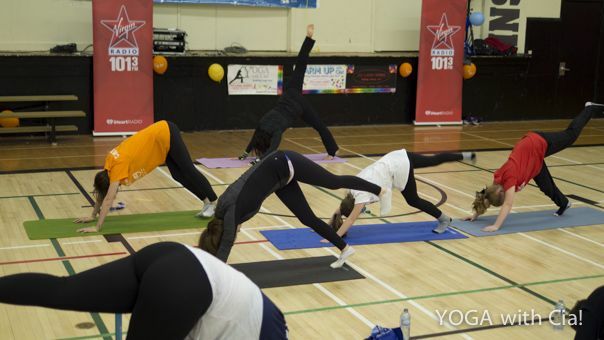 class and Fun Fitness Warm-Up at the 2019 Metro Universities RELAY For LIFE at Dalplex, March 30th. Dalhousie University, University of King's College, Saint Mary's University, NSCAD University, Mount Saint Vincent University and Yoga With Cia! students welcome. YOGA with Cia! at St. Andrew's 6036 Coburg Road, Halifax. Tuesdays at 12:15-1pm. Remember, it's only $5 Drop-ins, for Skinny LunchTime-Tuesdays! This 45 minute class is designed to help you burn a few extra calories and allow you to leave after only 30 minutes, if you wish. A weekly Hatha and Flow Yoga class to de-stress and energize your day. Come find your balance and have a few laughs with new friends. No previous experience neccessary, just a desire to have fun & re-energize! YOGA with Cia! at St. Andrew's 6036 Coburg Road, Halifax. Mondays at 5-6pm. *** A weekly, gentle Hatha and Flow Yoga class, for adults of all ages and skill levels, including beginners, designed to help to you relax, de-stress, stretch, strengthen and energize your body and mind. YOGA with Cia! at St. Andrew's 6036 Coburg Road, Halifax. Thursdays at 5-6pm. *** A weekly, gentle Hatha and Flow Yoga class, for adults of all ages and skill levels, including beginners, designed to help to you relax, de-stress, stretch, strengthen and energize your body and mind. YOGA with Cia! at Dalhousie University's Sexton Campus. 1360 Barrington St. Halifax. Thursdays at 1:05pm. Register through Dalplex. Excellent participant rates. Dalhousie and King's University students FREE! YOGA with Cia! at Your Place. Personal Yoga Training for you, or your small group, in the comfort of your own location, with the convenience of your own start time! *** Personalized Term - a YOGA with Cia! original. Life can be stressful, your yoga class shouldn't be. Eliminate stressful, inflexible start dates, deadlines or term lengths with our personalized term. Your term starts when you want! Register anytime through the year and enjoy excellent term rates, as low as $5 per class. Choose a 50 week ($250) term, 25 week ($150) term, or 12 week ($84) term, of one class a week. Purchase two terms and come twice weekly! Can't commit to a term, or make it to class weekly? Then try our popular pre-paid, 10 class Pass Card ($80) and come whenever is convenient for you! For the ultimate in flexibility, or just to try a class out, choose our Single class Drop-in / Trial rate, for only $9 per class. YOGA with Cia! Single or 10 Pass Cards... a great choice! Contact us below to pre-register, or buy a PassCard. "YOU'RE ALL WINNERS, for showing up today!" ... Cia. 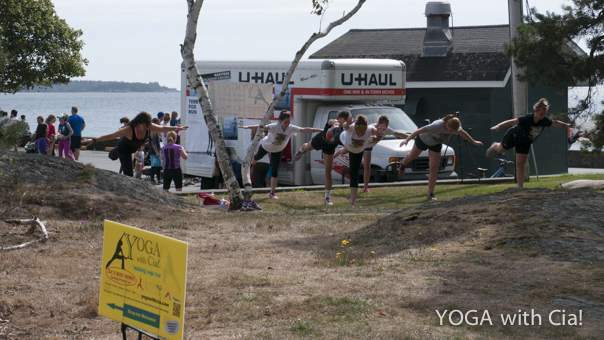 Register for our 12 week Spring term and enjoy fun, weekly, yoga themes in our 4th annual event. Starts the week of April 8th. and runs until the end of June. Good for adults of all ages and experience levels. Current participants may put their membership cards on hold. Details subject to change. Some items have limited quantities; register now! 1. Attend at least 10 of 12 weekly classes. 2. Send an email each week, prior to the next class, telling us TWO things; your favourite pose/sequence of that class... and how long the benefits of that class lasted. 3. Introduce someone NEW, using a complimentary YOGA with Cia! Guest Pass. 4. Optional - Pose For A Pose! Have us capture a fun pose of your favourite yoga pose or sequence... and/or a quote, for our YOGA with Cia! Video Wall! 5 YOGA with Cia! Passes (a $45/$25 value) for you or your friends! One more thing... By random draw, one lucky reward winner will also win an in-home PERSONAL YOGA TRAINING session for yourself (and a few friends, if you wish). Good Luck! Only $79 for Mondays or Thursdays / $59 for Skinny LunchTime-Tuesdays. e-Transfer accepted. Previous YOGA with Cia! Challenge Winners. Contact us below to pre-register for the 2019 Challenge. YOGA with Cia! Term, Plus FREE Lolë Yoga Mat. Get a great deal on a Yoga with Cia! Term Plus Free Yoga Mat Bundle. Purchase a 14 week Monday or Thursday term, plus a 6mm Lolë yoga mat and strap for only $99. If noon is a better time for you, choose a 20 week Skinny LunchTime-Tuesday! term, plus a 6mm Lolë yoga mat and strap for only $99. Utilize our Personalized Term and your term starts the week you choose! While supplies last, all sales final, no returns or exchanges. Free mat limited to 1st-timers! Contact us below to BUNDLE UP! CandleLit YOGA with Cia! for YMCA Peace Week. Thanks for coming to experience a magical, de-stressing, peaceful, candlelit yoga class at St. Andrew's Gym. Admission was free and door prizes were awarded. Videos at YOGA with Cia! 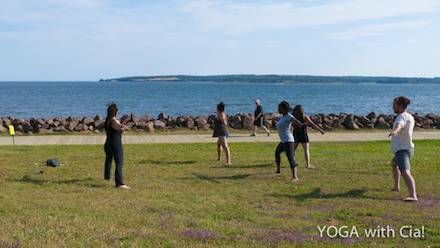 Have you seen our short videos with YOGAwithCia! students? 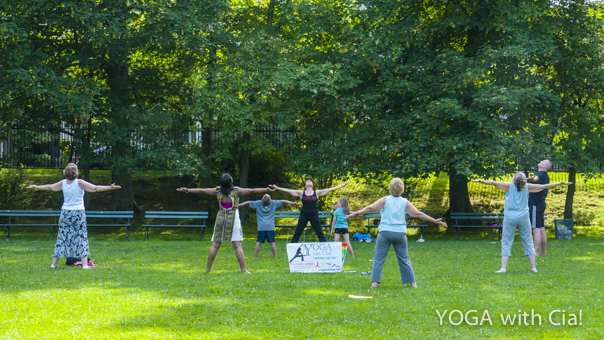 Check them out at our other YOGAwithCia! page at fitCia.com. Come have some fun with a POP-UP YOGA with Cia! class. A Fun and Free opportunity for you to try out a bit of YOGA with Cia! Come try something new, or add some yoga variety to your routine. POP-UP classes are non-regularly scheduled and offer random times and locations; you don’t know when, you don’t know where, until a few days before... yet change and variety can be exciting! Thanks for joining us at Terry Fox Run, September 16th at Pt. Pleasant Park, Halifax, the RELAY for LIFE 2018 in Dartmouth on June 16th., the 2017 Halifax TERRY FOX RUN, Bedford RELAY FOR LIFE, as well as the Dalhousie University RELAY FOR LIFE... and the 2016 Halifax CIBC Run For The Cure. 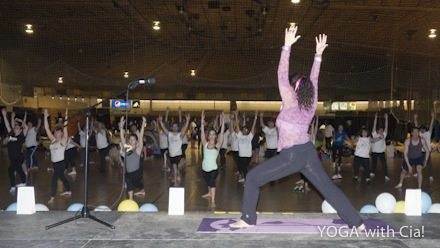 Cia provided energetic and Fun Fitness Warm-Ups to get started, then a re-energizing and Fun, POP-UP YOGA with Cia! session to cool people down, afterwards. Our next POP-UP class will be at the: Metro Universities RELAY For LIFE at Dalplex, March 30th. It will be Standing YOGA with Cia! so it is easy to follow... no mat, no money, no previous experience needed. You just need a desire to have fun. Feel free to ‘post’ or ‘share’ that you are going to a POP-UP YOGA with Cia! class; the more the merrier. Check back for details of our next POP-UP YOGA with Cia! or contact us and we’ll let you know! See you soon at a POP-UP YOGA with Cia! class near you... maybe somewhere on PEI! Come visit us on fitCia to see some of our videos. Contact us below, with your questions and comments, or to pre-register. Please type the secret code word NAMASTE above.